This is a dual-purpose report - partly for today's news, also to catch up from Friday, in particular with my thoughts on the latest profit warning from "omni-channel" fashion retailer, QUIZ (LON:QUIZ) . Revolution Bars (LON:RBG) is reporting its peak period Christmas & NYE trading today. As this is my 2nd largest long position, I'll be heavily focusing on that, once I've got the Quiz section out of the way. Quiz calls itself an "omni-channel" (meaning physical stores, concessions, online, and international) fashion brand (mainly womenswear, with a focus on garments for special occasions, rather than basics). The float was very polished, presenting the company as an exciting growth story, achieving a high valuation. I attended a presentation shortly before the float, and was impressed with management. The online growth seemed to offer the potential for this to become something like Boohoo (LON:BOO) in the long run. Thankfully, I gradually lost interest in it, as it became clearer to me that the float price had been set too high, and that online (the bit that interested me most) was only a smallish percentage of total revenues. Also, from looking at product, I began to have doubts about the quality of the product designs. RMillaree. I agree (I hold XPP). With the 17p Q2 div paid on 11 Oct, this effectively means free cash flow in the final quarter was flat. I still think that for the year as a whole the FCF for XP Power (LON:XPP) will only be about £6m, which is well down on the £20m in 2017. 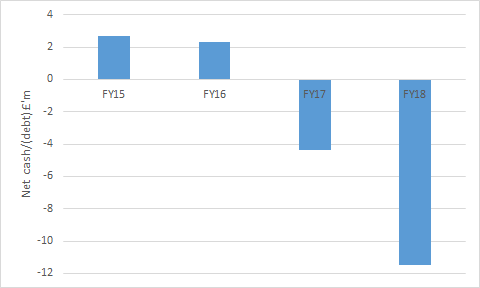 While working capital/ capex issues have been explained, I would hope for a signifcant improvement in FCF in 2019. Notice also XPP are now saying end17 net debt was £10.1m (previously was reported at £9.0m - presumably due to an accounting change. With half production in China and most sales into US, US/ China tariffs are still a key issue for XPP. Vietnam II coming on stream in 2019, might give some flexibility in the short term. So, didn't check the comments during day and saw a lot of activity. Thought it might be a particularly popular stock being discussed, but looks like we are not above the dopamine hit of other social media. I respect all views, including those that are contrary to my own, although I far prefer when people agree with me! I feel I need to agree with others and the trail of DYOR. If Paul, you or anyone else her can consistently sell to the greater fool, then I dare say, you will be more successful than the enterprising investor. A lot of investors and indeed some publications (I have the losses to prove it) rely on pump and dump. PS: not suggesting in anyway that people here/Paul/Graham/stocko are engaging in this, and quite frankly if they are, good luck to them! You are talking of Restaurant Group rather than Revolution Bars? This business operates two formats, Revolution and Revolución de Cuba, from 66 sites, and is currently adding around 5 new outlets per annum (a relatively immature roll-out therefore). The beauty of the business model is very high rates of return of around 40% on capital invested in the new openings, equating to a 2 year pay-back. In part, this is due to leasing the premises, meaning that pre-opening expenses are largely restricted to fit out costs. The expansion is being funded internally from the strong operational cash flow of the business and the balance sheet sports net cash. I estimate that we have been buying the shares on a cash earnings yield of about 9%. That was in February 2017, so around the £2 mark. I guess the argument is the same - either current management sort things out or there'll be a bid. You got me interested in Jersey law!! In brief, my reading of the following articles makes it look that the rules are equivalent in Jersey on the squeeze out/ scheme of arrangement and delisting as in the UK. But do read the docs for yourself - one from Ogier (on schemes of arrangement, where seeming the Jersey scheme under Article 125 of its Companies Law is equivalent to Part 26 of the UK Companies Act of 2005) the other from Practical Law - see section 2: 90% squeeze out also applies, according to section 22 - the rules on delisting would depend on the exchange (AIM for £QUIZ). Despite these attractions, Revolution slipped at the first hurdle as an investment when it issued a wholly unexpected profit warning based on management failing to anticipate and control certain operating costs. Revolution is now a sitting duck if management fails to get a grip. ...there is a fair bit of latent recovery and turnaround potential among our investee companies, for example Dignity, Provident Financial, Next, Revolution Bars, Restaurant Group and Dixons Carphone. Note the orientation toward the consumer in these 'beaten-up' businesses. I firmly believe they will come good in due course and contribute positively to our performance in years to come. Management really needs to up its game here or an end to the company's days of independence must surely be near. Expansion funded from internal cashflow - that's not been true for the last two financial years, where capex has exceeded operating cash flow by over £7m. Earnings yield of about 9% - I think it's still broadly in the same ballpark, as a result of both earnings and price deteriorating. Since most of those points are no longer valid it seems they either have confidence that the new management can turn things around, or (and possibly more likely?) they're banking on a takeover. Keith Ashworth-Lord still positive: topped up to just under 19% a short time ago. There was an RNS fro RBG to that effect this afternoon, took the holding up to 18.91% from 17.52%, seemingly last Thursday. It's curious that Keith is topping up. A few months ago he summarized Revolution Bars (LON:RBG) problems as a, failure to control operating costs satisfactorily. Perhaps he is seeing signs of greater cost control, or a possible buyout. Keith is normally right, but has made a couple of slips buying more Dignity and Tesco when their businesses deteriorated. Edit: Just noticed this RNS comment concerning increased Operating costs, which rather rules out the former..... The Board expects adjusted EBITDA for H1 FY19 to be approximately £2m lower than last year due to the like-for-like sales decline and increased operating costs. Hmm! It's curious that Keith is topping up. It's not clear that he is from the RNS alone, which is from Castlefield. Buffetology is one of Castlefield's funds. There may be something else pointing directly to an investment by the Buffetology fund, but I'm not aware of it. Seems the Buffettology sister fund has taken a small slice too. The curious thing here is that looking at the numbers now, there is no way that Revolution Bars (LON:RBG) would fit Keith's Buffettology quality selection criteria. This additional purchase is a wild card. But yes, it's curious. I think it must go back to the original statement from Keith - it's a good business at a temporarily depressed price. Either the management fixes it or someone else will. Not really a sector I normally dabble in, but it's odd enough to take a harder look, I think. Ref the CFP SDL Buffy fund - it looks like this has grown exponentially over the last 3 years - the fund was 95 mill in Feb 17 and is now £519 million !! So to keep Revolution Bars (LON:RBG) at the same % of the fund only they would have massively had to increase the size of their holding anyway. I do think there is a danger of falling for a company's - it has been good, now not so good, but we are fixing it type narrative when its profitability numbers (and sector) tell a different story. The share price could fall a lot more yet. "You got me interested in Jersey law!!" Sorry about that! I have always been slightly sceptical about QUIZ (LON:QUIZ) so I never bought any shares. I still don't understand why a Scottish business would choose to register in Jersey. Corporation tax rate in Jersey is 0%, probably explains it. "Corporation tax rate in Jersey is 0%, probably explains it." I doubt that is the reason. This statement is copied from the 2018 results. "The reported tax rate in the current is 20.2% (FY 2017: 18.4%). The Group's effective tax rate in future years is expected to be broadly in-line with the statutory rate." I guess though the SVCR is already an "alternative view" from the stockopedia ranking system and the type of shares Roland Head discusses as it looks at lower ranking shares. Just got round to looking at the comments - thanks everyone for some great feedback! Nice finds timarr. If Keith is looking on Restaurant (LON:RTN) and Revolution Bars (LON:RBG) as value type situations then I can understand his initial interest although I do find his continued purchases somewhat perverse. Neither of these companies is exactly out-performing and buying more in the hope of a trade purchaser stepping in seems like a fool's errand. Great analysis bestace. I agree with all of your points and find the deterioration from net cash to net debt to be particularly disturbing. The roll-out is meant to be self financing but clearly cash-flow isn't up to the job. I wonder if Keith is suffering from some sunk cost bias here? I know that he dumped Tesco and Dignity very quickly when they went sour but he's been in Restaurant (LON:RTN) and Revolution Bars (LON:RBG) for quite a while and perhaps that's the problem?